Our family and our friends have been chartering Asta Yachting boats for years and we are very satisfied with friendly service and good prices. Asta is our first and favourite choice. I love Croatia and its beautiful islands which I visit with my crew every year. 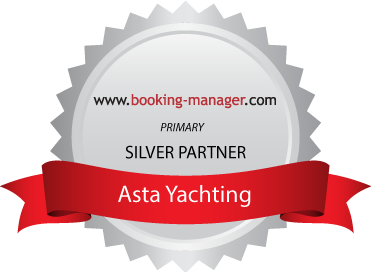 Our charter company Asta Yachting always takes best care for us in a friendly way. There are no problems, everything functionates perfectly, boats are in great condition and Asta staff could not be any better. Thank you dear Asta, this year we’ll meet again! We highly recommend your service to everyone! I've been using Asta Yachting service for several years. I have to say they are really professional, willing to provide high quality service, any kind of help and always make me feel welcomed. For all who search quality and professionalism like it was before and is rare nowadays, I recommend Asta Yachting. We have been sailing with Asta Yachting since 1997 (Andis Charter). Sailing area is gorgeous. Boats are always very well maintained and in very good condition. Asta team was, and is always friendly and helpful in all occassions. We are in good hands. If we would have to rank Asta Yachting , then we would rank it with 5 stars. The boats are very well maintained and older boats are in a good condition. I rented boats from other companies in the past, but for now I'm staying faithful Asta company, because of their perfect service. Regarding the sailing area I have nothing additional to write, because the area is so legendary that everything has already been said in the WWW. Since 2009 I regularly rent boats at Asta Yachting and before that I had some other charter companies (including the "Pharmacies" of TUI Marine). Asta Yachting is in accordance with the points service and reliability minimum as good as the providers above. I have previously chartered boats in the various age groups at Asta. The elderly were also very well maintained. The check-out procedure was always professional and without difficulties. I have signed my contract always directly with Asta (not via agencies), again, never had any problems. For me, Asta Yachting is charter company offering the best value for money in the Mediterranean area. My family (children 2 and 4 years old) and I are looking forward to the next trip. From 20. June we will be sailing with boat Elan 431 (1998) "Mjesec" in beautiful Adriatic again. I've been chartering boats at Asta Yachting for more than 15 years in a row because I am always satisfied with maintenance of the boats and the ratio between prices and quality of service. We didn't have any problems in any of our sailing trips because boats were always very well technically maintained. We are looking forward to our next sailing trip in June. Till then, kind regards to Asta team. Since 2006 I charter boats always and only at Asta Yachting, guarantee for reliability and correctness. Why? - Professionalism of competent and teamed workforce and well-equipped service which takes care of very well maintained boats and always prepared intervention service for unexpected situations on the sea. - Problems with starter? Just call for a quick repair at sea. - Flippers forgotten on the boat without realizing it until next year? They are waiting for you at Asta reception. - Booking request outside normal working hours? Friendly staff members have a sense of pragmatism. Although newer and younger boats are generally better than the older ones, in situations when any kind of problem occured on older or newer boat I rented, Asta Yachting was at my disposal every time and took care for the problem without any inconveniences and with maximum engagement in best possible way. Now, I can really say that I became very good friend with the whole Asta team (both reception and skippers) through all these years and that we are impatiently looking forward to our next family sailing trip. I have been chartering boats at Asta Yachting since 2001. My satisfaction is evidenced by my loyalty to this charter company. Boats are well equipped, excellently maintained and offered under correct conditions. I am especially satisfied with quality and professionalism of Asta intervention service needed in case of difficulties at sea. I feel very welcomed thanks to friendly, attentive and knowledgeable Asta Yachting team. We would like to take this opportunity to sincerely thank Asta Yachting for excellent care in recent years. Special THANKS to the office team, which was and is always helpful to find a solution for all small and big problems. Special THANKS to all skippers on the piers and their advices and willing to help. We wish you continued success and we are looking forward to our cooperation in the coming years.